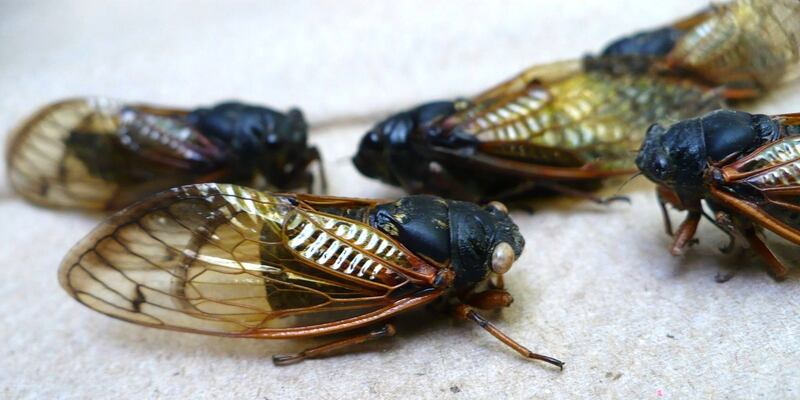 In 2015, all seven species of Periodical Cicadas will emerge in eastern North America! Alexander, R.D. and T.E. Moore. 1962. The evolutionary relationships of 17-year and 13-year cicadas, and three new species (Homoptera, Cicadidae, Magicicada). Miscellaneous Publications, University of Michigan, Museum of Zoology 121: 1-59. Bauernfeind,	R.J.	2000. 1998	Distribution	of	Brood	IV	Magicicada (Homoptera:	Cicadidae)	in	Kansas. Journal of the Kansas Entomological Society	73: 238-241. Bibby, F.F., 1936. The cicadas of Texas (Homoptera: Cicadidae), MSc Thesis, Agricultural and Mechanical College of Texas, College Station, TX. Bromley, S.W. 1933. Cicadas in Texas. Psyche, 40(4): 130. Davis, W.T. 1925. Cicada tibicen, a South American species, with records and descriptions of North American cicadas. Journal of the New York Entomological Society 33: 35–51. Drew, W.A., F.L. Spangler, & D. Molnar. 1974. Oklahoma Cicadidae (Homoptera). Proceedings of the Oklahoma Academy of Science, 54: 90–97. Dybas, H.S. and M. Lloyd. 1974. The habitats of 17-year periodical cicadas (Homoptera: Cicadidae: Magicicada spp.). Ecological Monographs 44: 279–324. Marlatt, C.L. 1907. The periodical cicada. USDA Bureau of Entomology Bulletin 71: 1–181. Marshall,	D.C.	2001. Periodical	cicada	(Homoptera:	Cicadidae)	lifecycle variations,	the	historical	emergence	record,	and	the	geographic	stability	of	brood	distributions. Annals of the Entomological Society of America	94: 386-399. Moore, T.E. 2000-2008. Checklist of cicadas North of Mexico. In: Walker, T.J. & Moore, T.E. 2000-2008. Singing Insects of North America. Sanborn, A.F. and P.K. Phillips. 2013. Biogeography of the cicadas (Hemiptera: Cicadidae) of North America, North of Mexico. Diversity 5(2): 166–239. Simon, C. 1988. Evolution of 13- and 17-year periodical cicadas. Bulletin of the Entomological Society of America 34: 163-176.